How does the FDIC help bank customers or consumers? How can I work for FDIC? How can I learn more about the FDIC? How can I contact the FDIC? 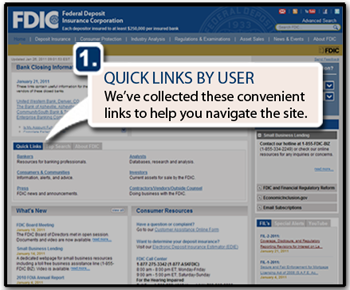 Quick Links, located on the homepage, lists the most popular materials categorized by "types of users" of the FDIC's web site. These links are customized to meet the needs of each group. These listings are not all-inclusive. If you cannot locate a resource on a Quick Links page, you should try the site's main navigation or the search. Current assets for sale by the FDIC. Deposit Insurance - Information on insured institutions, deposit insurance coverage of individual accounts, and the deposit insurance premium system. Consumer Protection - Resources to educate and protect consumers, revitalize communities, and promote compliance with the Community Reinvestment Act and fair lending laws. Industry Analysis - Financial information on specific banks as well as analyses of the banking industry and economic trends. Regulation & Examinations - Information on banking laws and regulations and applicable policies and procedures used by the FDIC in examining financial institutions. Asset Sales - Information concerning loans, real estate, and other assets for sale by the FDIC in its role as receiver for failed institutions. News & Events - FDIC announcements and a schedule of FDIC-sponsored events. About FDIC - Explanations of who the FDIC is and what we do, as well as the corporation's plans and reports, current job openings and business opportunities with the FDIC. Many of the pages in the site contain breadcrumb trails. The trail shows where the product lives inside the site's information architecture and contains live links to the higher level pages. The breadcrumb trail gives you one-click access to each of the pages it lists. 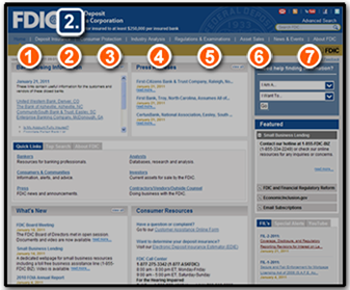 The FDIC logo at the top left corner of each page is a link to the site's home page. A Home link is also contained in a list of links at the bottom of each page. 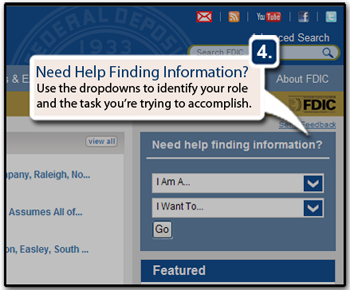 The FDIC now provides a new way for our users to find information. Use the "I am" dropdown list to identify your role and the "I want to" dropdown list to identify the task you're trying to accomplish. Full Text Search - This page enables users to search the text of all materials for specific user-defined terms and phrases. The quick search box located at the top of each page on the site provides the same search capability. An Advanced Search with several more options for focusing your search is linked from "Full Text Search" and from the search results pages. The SiteMap lists every product on the website both in a table sortable by alphabetical order, and the information category in which the product lives. Contact Us gives names, addresses, phone numbers and e-mail addresses, listed both by topic and by official's title. This section of the website also provides related information like Access to Washington, DC, Facilities; Delays in Mail Delivery; and links to Other Government Financial Agencies. Please provide your feedback on www.fdic.gov to webmaster@fdic.gov. Every FDIC.GOV page provides a mailto link to the official responsible for that page. By clicking on that link, you open a pre-addressed form that will be e-mailed to that official. FDIC policy is to publish Web documents in HTML. As a courtesy the website occasionally provides ancillary versions documents in other formats (e.g., Adobe Acrobat, Microsoft Word, Microsoft Excel, and Microsoft PowerPoint). The link to a file coded in an alternative format is accompanied by a notice giving the format, the file size and links to information about how to access files in that format. Navigation/menu pages are formatted so that they will print all of a page's contents. Content pages, however, omit the standard header when printing. If you want to print the header on a content page, you will need to use the "Print Screen" command. All pages suppress background colors when printing. FDIC policy is to make all products published after June 21, 2001, accessible to people with disabilities. The FDIC provides the ability to receive information updates several different ways. An email subscription service, RSS feeds, or the FDIC page on Facebook or Twitter allows you to receive many different alerts, including news releases, Financial Institution Letters, consumer updates, statistical publications and others. The links to each of these outlets are available in the upper right corner of every page, just above the Search box. Each browser may display FDIC.gov pages differently. However, if your browser supports HTML5, the FDIC.gov will render correctly. Please click on the links below to ensure that your Internet browser is up-to-date, or to get answers to common questions about your Internet browser. 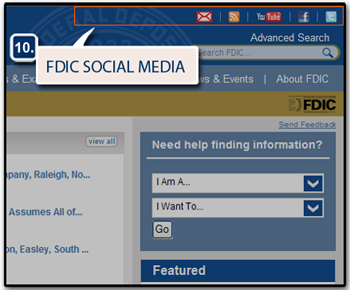 If you are encountering problems in viewing our site or if you have web support related questions (or comments) about FDIC.gov, please contact: webmaster@fdic.gov. Internet Explorer (IE) 11 and the previous two versions (IE 10 and IE 9). Mozilla Firefox (All recent versions). On iPhones/iPads, the user can open a PDF in an internet browser and then select open in iBooks. Once it’s opened in iBooks, it’s saved to your phone for offline viewing in iBooks. Most Android devices allow you to save the PDF to directly to your phone like any other file. Amazon's “Send to Kindle Desktop App” for both Windows and OS X lets you send compatible files to your Kindle just by right-clicking on them on your computer and pressing "Send to Kindle".